How High Can Captain Marvel Fly at the Box Office This Weekend? How to Train Your Dragon: The Hidden World won its second straight weekend at the box office with $30 million last weekend, but DreamWorks found a bright spot in an otherwise grim month. It was a very bad February at the box office. Revenue, overall, was down 26 percent when compared to this same time in 2018. But who, one might ask, is going to come in and save the day? The answer to that question is Captain Marvel, which is poised to give a much-needed boost to box office revenue this weekend. The only question is, just how high can Marvel's latest fly? Captain Marvel, which stars Brie Larson as Carol Danvers, aka the titular superhero at the center of this new entry in the Marvel Cinematic Universe, is poised to have a massive box office debut this weekend. Industry estimates have the superhero flick bringing in anywhere between $125 to $145 million through Sunday. Even on the low end, or below the low end, that would be an excellent start. Ryan Fleck and Anna Boden direct the 90s-set entry in the MCU, which, thus far, has received a great deal of praise from critics, as it currently sits very comfortably with an 85 percent approval rating on Rotten Tomatoes. While trolls attempted to review bomb the female-led comic book movie ahead of its release, it would appear those efforts were for nothing. 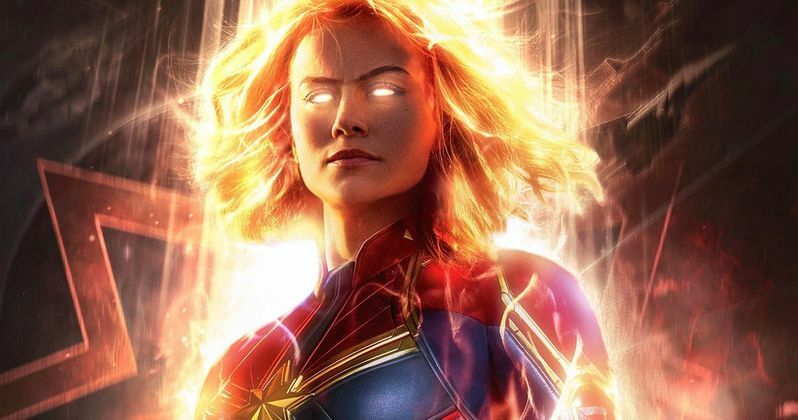 Certain estimates peg Captain Marvel at $150 million or more on its opening weekend, which would be second only to Black Panther ($202 million) for solo title doubts within the MCU, and it would be what Wonder Woman managed ($103 million) when it opened in 2017. Understandably, no other studios are releasing any movies nationwide this weekend as to avoid the major competition. It will ultimately be a fight for a very distant second place. That should go to How to Train Your Dragon: The Hidden World, which looks to bring in another $15 to $20 million or so, depending on how much steam it loses heading into its third frame. The DreamWorks release should surpass $400 million worldwide come Sunday. Tyler Perry's latest, Tyler Perry's a Madea Family Funeral, should easily take the number three spot with around $15 million. Rounding out the top five will be The LEGO Movie 2: The Second Part and Alita: Battle Angel in what could be a tight race. Though, the former may get the advantage here, as Captain Marvel could steal much of the same audience who would turn up to see the latter. Be sure to check out our full list of weekend box office predictions below and check back with us on Sunday for the weekend estimates. These numbers were provided by Box Office Mojo.